On Saturday July 30th and Sunday July 31st, hundreds of people came out to Spectacle 752 Queen St. W. in Toronto for an inside look at the Fall / Winter 2016 Barton Perreira eyewear collection, and to get a glimpse of what their own faces would like with the latest Hollywood fashions perched on their noses. Spectacle had over a hundred brand new Barton Perreira eyeglasses and Barton Perreira sunglasses to exhibit, plus some fantastic new Allied Metal Works eyewear to show off over the weekend. The collections were unpacked on a white Plexiglass counter at the front of the store. So many visitors took selfies and tweeted and Instagrammed their personal images with the #BartonPerreira hashtag. They wanted to be the first among friends to connect with this sophisticated glam and let everyone in their circles see how they were Toronto trendsetters. 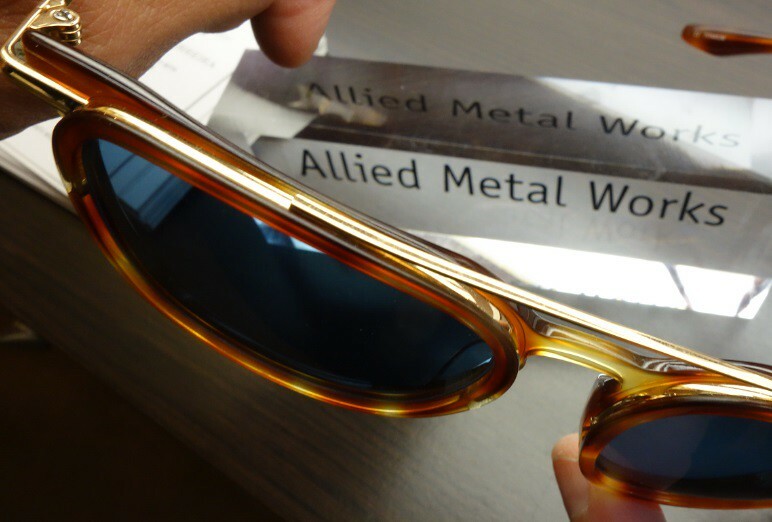 Above is very stylish pair of Allied Metal Works sunglasses available for sale in the store. This was already on the shelf beside a dozen of its sisters. The new Barton Perreira eyewear, unpacked and put on display by the brand rep at the front of the store was nothing less than spectacular. Twelve trays of glasses excited people who came in the door by forcing them to imagine all the possibilities. 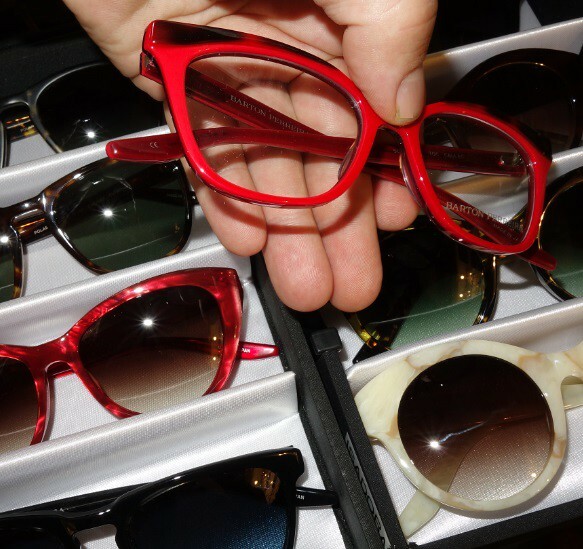 The new frames appeared in subtle calicos and creams, and also some pairs were shocking red with accents on the brow. There were lovely blue and green sunglasses too, with matching blue and green tinted lenses in the frames. On the Barton Perreira website it says, “Dedicated to pure luxury, Barton Perreira’s approach to fashion redefines style and elegance. Patty Perreira’s inspired design continues to challenge the industry by unveiling the next new thing.” And here was the next new thing right here in our store. This is one of the hottest brands in Hollywood right now. Stephen Colbert debuted his Barton Perreira eyeglasses on his show earlier in 2016. Its the name that so many modern celebrities are choosing, because of the unique shape of the frames, their colours and emotional messaging. The glasses are stylish and easily recognizable. Celebrities spotted wearing them are considered trendy and cool by fashion reporters. Designer sunglasses are always evolving as a fashion accessory. Over the last decade, many younger smaller sun wear brands have appeared on the scene to challenge the status quo of the bigger players. Unlike the dominant European design houses, these start-ups opted for more subtle logo designs and much reduced branding. Instead of putting their iconography on every surface, they focus instead on creating confident, ‘impactful’ shapes and styles that carry little or no corporate messaging. Think back on how it was in the nineties. The market was ruled by big European brands like Gucci, Chanel, Versace, and Dolce&Gabbana which made over-sized eyewear in their own distinct brand styles. Men and especially women would wear their sunnies on their heads indoors to continue showing off the brand logos emblazoned on the arms of the frames. Women’s sunglasses often doubled as hair accessories! But sunwear fashion has changed again. Here in Toronto we see the growing popularity of younger more sophisticated brands propelled by designers that work to give their glasses an emotion presence , more intricate detailing, and more obvious quality. Spectacle has a long and well documented relationship with Bill Barton and Patty Perreira. Just two weeks ago, on July 16th 2016 the company opened its first store in New York City, a little boutique off of Madison Avenue. The designers hired Architect David Spinelli to transform the space into their new brand flagship. It joins four other stores across the USA. The California-based eyewear company has now conquered America and is ready to expand overseas. 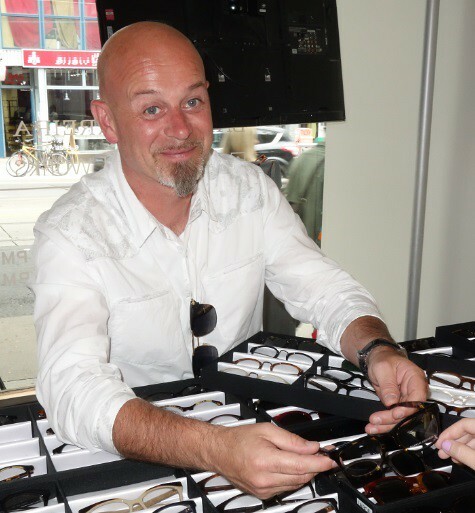 In Canada their eyewear is only available in a few select stores, and Spectacle has been proud to call themselves a licensed distributor for many years. Here’s the fantastic video we played all weekend that gives a great deal of insight into how the eyeglasses are manufactured by highly skilled craftsmen in Japan. Barton Perreira Factory Video : Hand Made in Japan. from Barton Perreira | BP on Vimeo. The summer long weekend Barton Perriera show was a real eye opener. Happy Victoria Day from Spectacle! Spectacle is the award-winning lifestyle brand retailer that cherishes diversity and encourages individuality and self-expression through exceptional eyewear. Founded in 1999, Spectacle has emerged as the perennial first choice destination for legions of passionately loyal customers, whom are respected with unparalleled service that is always attentive, informed and friendly. We relentlessly research, carefully select, artfully showcase and perfectly craft the absolute finest quality and cutting-edge designer eyewear brands sourced from all over the world. 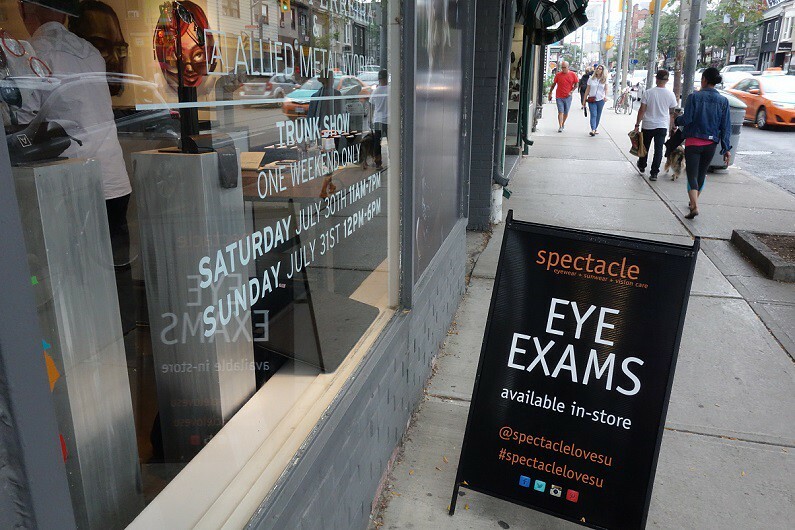 Our modern boutiques proudly provide the distinguished Toronto neighbourhoods of Lawrence Park, Queen West and The Historic Distillery District with comprehensive vision care, eyeglasses, sunwear, contact lenses and eye exams.